The unique partnership between Morgantown Learning Academy and the Mountain Stewardship and Outdoor Leadership School is expanding into an exciting learning experience for the youngest of our students. The Little Acorns is our newest addition to integrating hands-on, experiential outdoor education into early childhood education. Who are the Little Acorns? 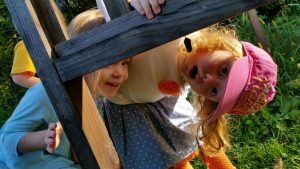 Little Acorns is for 4-year old students and integrates nature-based preschool, or waldkindergarten, approaches to a traditional American preschool education. This class will meet 5 days a week in the afternoon from 12p-3p. 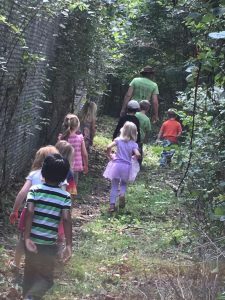 A nature-based preschool combines environmental education with early childhood education to create meaningful outdoor experiences that are developmentally appropriate. Environmental education aims to provide knowledge and skills, along with an emotional connection, to lead individuals to environmentally responsible behaviors. In a nature-based preschool, students build cognitive skills like divergent thinking, physical skills like balance, coordination and endurance, and social and emotional skills like problem solving, discovery, and conflict resolution. The emotional connections of environmental education along with the sensory and play-based learning of early childhood come together to form a powerful educational experience in a nature-based preschool. All lessons are based in the natural world where we’ll explore, learn and identify the plants and animals that live in our forests. Following along with the seasonal changes, students will experience the various cycles that encompass the daily life of the the human and natural environment. From the water cycle to the life cycle of a frog, we will discover and investigate the wonders of our world. Our lessons are meeting all classroom requirements in an experiential way. Because this program is nature-based, there is a large emphasis on outdoor, hands-on experiences. This means we’ll be outside in all types of weather! Each day children have time dedicated to outdoor exploration and play. Children should come prepared with outdoor gear for any weather. We do, however, take safety seriously and will not be outside in unsafe weather and temperatures. During our indoor class time, we are still nature-based! Each morning we will start with a yoga and mindfulness exercise where our imaginations will take us on an outdoor adventure. Our classroom will be decorated to resemble the forest with trees, plants, a stream, a campfire, and a reading cave. The outdoor learning doesn’t stop when we go indoors! Why should I enroll in this non-traditional class? The unique partnership between Mountain SOL and MLA brings a special touch to this program. Beth Gardner is MLA’s preschool teacher for the 3 and 4 year old students. Ms. Beth has over 20 years of experience with early childhood education and holds a Master’s in Music and Elementary Education. Her love of the outdoors and teaching young children serves as the foundation of this program. Hannah Spencer and Lucas Sieber are Mountain SOL educators who will be co-teaching with Ms. Beth to integrate the nature-based experiences into every day lessons. Ms. Hannah is a graduate of WVU’s Recreation, Parks, and Tourism Resources program and has extensive knowledge and a profound love for the plants and animals of Appalachia. Mr. Lucas brings his experience in horticulture, landscape architecture, and love of the outdoors to our classroom. Growing up on a tree farm, he spent many hours outside. As a master amateur explorer, Mr. Lucas is the best at finding discovery and a sense of wonder in the smallest of plants and creatures. How do I learn more about enrolling my Little Acorn? To learn more about tuition rates and schedule a site visit, please contact Morgantown Learning Academy by phone at 304-296-9554 or email at [email protected].